3 Levels Ring Brightness: With Low/ medium/ high different levels of brightness, you\'ll find the perfect lighting needed for your photos. 36 LED bulbs lights provide lenses fill light effect for creative photography and video graphy in dark environment. Look Flawless in Your Selfies: This little light is all about making your selfies best! The light gives soft illumination without harsh light. It\'s like having a professional studio photographer. 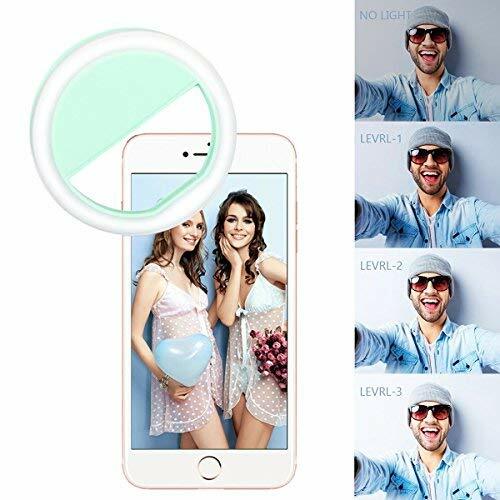 Multi Usage: You will be able to make videos at night or take great selfies in dark areas; you can use it with your rear camera to have high fidelity photos; you can also use it as torch, emergency light, making up light and even more! USB Rechargeable to Save Money: Rechargeable with USB cord, this circle light includes a built-in rechargeable battery so you do not need extra batteries. Saves you money and no annoying battery replacement! Compact & Easy to Carry: Portable size makes it easy to put in your purse, just clip easily onto your phone or iPad.